Rootless voicings are also known as left hand voicings or Bill Evans voicings so be aware that these three terms refer to the same thing. In this lesson we are going to cover what a voicing is, what makes it rootless and why we use rootless voicings. We are then going to build rootless voicings for major, minor and dominant chords and then cover the best way to practise these voicings so that your are comfortable playing them on demand in all 12 keys. Rootless voicings are an essential skill for the modern jazz pianist. To play a rootless voicing, we leave out the root of the chord and play one of the chord extensions instead so for example we could play the 3rd , 5th , 7th and the 9th could be the additional extension of the chord. Rootless voicings achieve very smooth voice leading in the context of a rootless 251 progression. This reduces hand movement and will make your playing sound much more professional and sophisticated than root based voicings. Rootless voicings are also useful in a solo piano context and are a great voicing choice to support soloing and improvisation in your right hand. What Are Rootless Chord Voicings? A voicing is the way that we choose to spread out or arrange the notes of a chord on the keyboard. We learn in the lesson on chord extensions that we can extend the chord past the octave to play the 9th, 11th and 13th . To play a rootless voicing, we leave out the root of the chord and play one of the extensions instead so for example we could play the 3rd , 5th , 7th and 9th of the chord. Why Do We Use Rootless Voicings? The first is that the chords will flow from one to the next very smoothly which sounds great to the listener! 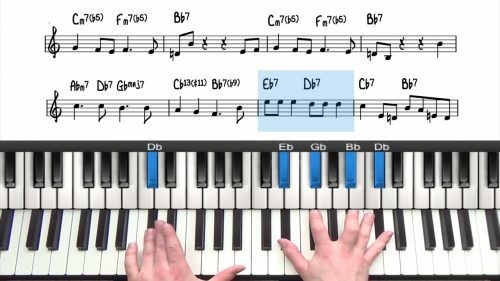 The second is that it reduces hand movement to a minimum so that you can move from one chord to the next very easily and focus you attention on soloing in your right hand. Rootless voicings free up a finger for more interesting and colourful note choices such as a 9th, 11th or 13th which makes your playing sound more professional. If you are playing in a jazz band, the bass player will have the root of the chord covered so there is no need for you to play it. To turn a major chord into a rootless voicing, we add the 9th and then drop the root. The alternative way to build a rootless voicing for major chords is to build a minor 7th chord off the major 3rd . In the key of C you would build a minor 7th chord of E which is the third. We build minor rootless voicings in the same way as with major chords, we add the 9 and we drop the root. Remember that both major and minor chords share the same 9th. The alternative way to build a rootless voicing for minor chords is to go to the minor 3rd and build a major 7th chord. In the key of C minor we build a major 7th chord of Eb which is the minor 3rd. There are two important inversions that you need to learn for rootless voicings: Type A and Type B. Type A rootless voicings always have the 3rd on the bottom and Type B always have the 7th on the bottom. An easy way to get from Type A to Type B is to take the bottom two notes and put them on the top (or take the top two notes and put them on the bottom). You might be wondering why we invert rootless voicings and the answer is so that we can play them in the correct register of the piano. Rootless voicings sound best when played right in the centre of the piano (around middle C). If you play rootless voicings too low on the keyboard they will sound ‘muddy’ and distorted. If you play them too high they will sound very ‘thin’. By inverting rootless voicings you can always play them on or close to the centre of the piano to get the best sound. Rootless dominant 7th voicings are a bit trickier than major and minor chords. We could voice them in the same way that we have voiced the major and minor chords. However, this would not voice lead smoothly in the context of a 251 progression. Instead we substitute the 5th for the 13th. This creates tension and dissonance between the 13th and then b7th . You should practice rootless voicings most times you sit down to practice until you can play them in all 12 keys without mistakes. Play the root of the chord in your left hand and then a rootless voicing in your right hand. Take this around the circle of fifth, then move up and down chromatically, then choose keys at random to test yourself. Make sure you are analysing the notes you are playing and identifying the chord tones and extensions in relation to the underlying bass note. Once you are comfortable with this, drop the root and play the rootless voicings with just your left hand. Repeat the above exercises. It can be a challenge at first to visualise the chords without the root so stick with it! The next step is to combine these chords into the rootless 251 progression.